Welcome to the new ABSS website. We are proud to announce the launch of our newly redesigned website. Our new site has a modern layout and design, it is optimized to view it in multiple devices and using any level of internet connection. We have more of a focus on social media and you can follow us on Facebook, Google+, Linkedin and Youtube. We encourage you to explore our new website and to give us your opinion. October 2014 and we have been fortunate to have received World Wide Coverage with release of Camfil Farr's latest case study. Camfil Farr's Case Studies are distributed Globally and can be found on their website. 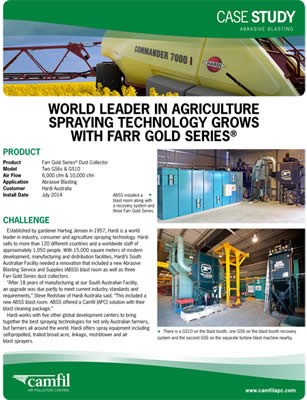 In July 2014, ABSS Designed, Engineered and Manufactured a Blast Room Solution for Hardi Australia, one of the Worlds largest and most recognised Agricultural Spraying Machine Manufacturers and utilised Camfil Farr Gold Series Dust Collection equipment into our solution. The result is one of the finest installations in Australasia. Thank you Camfil Farr we appreciate the recognition. July 2014 and we have released our New and Updated Catalogue V2.0 Our new catalogue incorporates the Blast Cabinet Catalogue and has many new items and categories. We are pleased and excited to launch the Second Edition of our Catalogue - Abrasive Blasting Vessels & Accessories. Request a hard copy, simply fill out the "Contact Us Now" section to the left of this page. ABSS have secured yet another Blast Facility in the Defence Sector. ABSS have had great success focusing on the Defence and Mining Sectors. 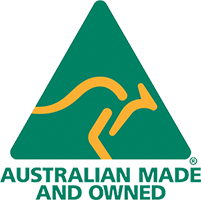 In the competetive Australian market, ABSS stand alone as the preferred choice for Australian Designed, Australian Engineered and Australian Manufactured products. With the increase of imported and cheap products into Australia, more than ever it is important to know what you are purchasing and where your money is going. 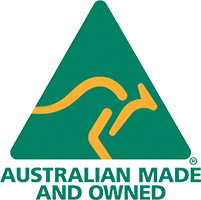 Support Australian Made Products and buy your kids a future. ABSS are excited and proud to announce that our range of Performance Blast Vessels and ABSS Sand Blast Cabinets have now been given the approval to promote and advertise the Official Australian Made Logo. With the increase of imported and cheap products into Australia, more than ever it is important to know what you are purchasing and where your money is going. Support Australian Made Products and buy your kids a future.. Finally it has arrived. 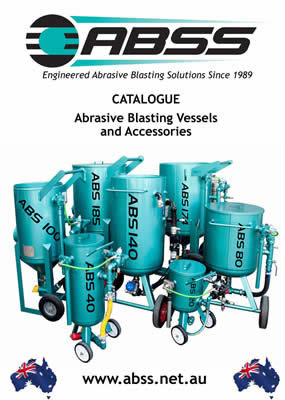 With more than two years of development, ABSS are excited to launch the first edition of our new Catalogue - Abrasive Blasting Vessels & Accessories. Would like a hard copy, simply fill out the "Contact Us Now" section to the left of this page. Cant wait? Click Here to view or download a PDF copy. While ABSS's Business Development Manager, Jon Sweet was off tying the knot in Thailand, the rest of us were working hard back here in Australia at National Manufacturing Week 2013. 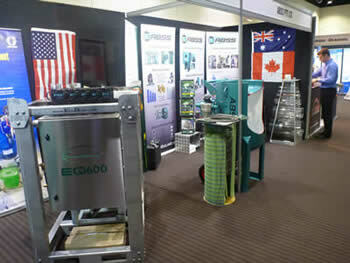 ABSS's stand showed off part of our range of Australian Made Abrasive Blast Equipment. National Manufacturing Week was held in Melbourne at the Convention and Exhibition Centre. Overall it was very successful for us and our stand was very well attended. 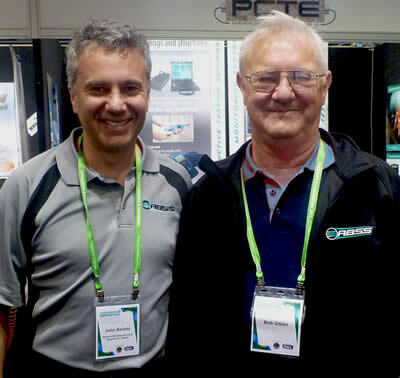 (Pictured Above Right) Mr Dave Higgins, General Manager APC Camfil-Farr congratulates ABSS Managing Director Mr John Bellato on yet another recent successful joint ABSS and CamFil Farr project. ABSS are excited to welcome Mr Bob Giblin to our organisation. Bob brings with him many years of experience in the Abrasive Blasting and Shot Peening Industries. Bob's experience dates back to Godfrey Blast days and has spent the last 16 years with Pan. Welcome Bob. We're glad to have you on board. ACA2012, ABSS attended the Australasian Corrosion Associations annual Conference. Held over three days at the Crown Conference Centre located in central Melbourne, we exhibited our products over two stands. The focal point over the three days was the new EQ600C by EcoQuip Vapor Blast™ Systems. The new Model EQ600C Vapor Blast™ System showcased many new features that impressed the delegates and contractorsand opposition companies alike. The simplicity that EcoQuip have innovatively incorporated into their system is World Class. Well done EcoQuip!!! ABSS have released its own range of Tri-Clover Quick Disconnect Fittings. 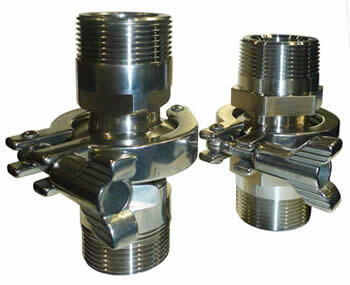 The ABSS Tri-Clover Fittings offer a simple method to divorce the Abrasive Metering Valve from the Blast Pot. Simply unscrew the Wing Nut, remove the Collar and the Abrasive Feed Valve is divorced from the Blast Pot. Constructed from 304 Stainless Steel, the ABSS Tri-Clover Fittings are available in 1-1/4” NPT and 1-1/4” BSP. Suitable for all Abrasive Feed Valves with the above thread combinations. ABSS successfully tendered and completed the design, engineering, manufacture and installation of Two (2) 10 Tonne Mega-Blast Systems for a Major Adelaide Based, Australian Defence Contract. The units supplied have a Blast Vessel capacity of 10,800kg. Above each Mega Blast Vessel is a Storage Hopper also with a 10,800kg Capacity. 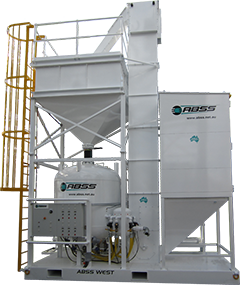 Unique features include a fully enclosed Abrasive Media Loading Chamber that feeds the Garnet Media to the 7500mm Bucket Elevator which in turn feeds the Storage Hopper. ABSS designed and patented a unique Short Proof System which was requested by the client in order to protect the Blast Operators from electric shock should it occur, whilst using the Twelve (12) Electric Deadman Handles. Contact ABSS now, the Australian Leaders in Custom Designed Blasting Systems. 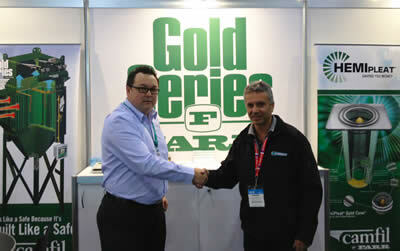 ABSS welcomed to Australia, Mr Chris Newingham from EcoQuip. Chris made the trip from the US to spend a week with ABSS Staff training and demonstrating the EQ600C Wet Abrasive Blast System at our Keilor, Victoria Head Office. The system is sure to raise a large amount of interest as there are so many benefits to this system. Able to be used with any Abrasive Blast Media heavier than Water, up to 75% Less Abrasive Media over Dry Blasting Methods and more than 90% Dust Suppression. 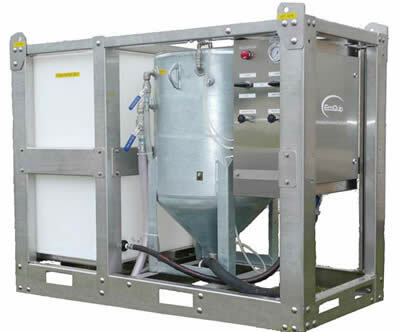 ABSS have pleasure in announcing our alliance with Camfil Farr.ABSS are introducing the Gold Series Dust Collector as part of the ABSS Blast Room System. 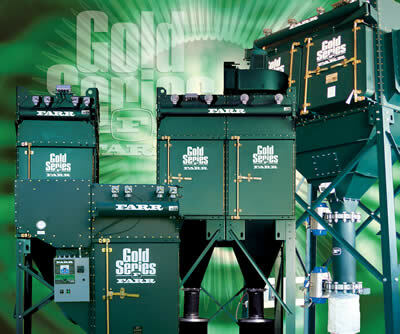 The Camfil FarrGold Series Dust Collector has long been regarded as one of the best systems on the Global Market available today. This partnership ensures our customers that when they choose an ABSS Blast Room System, they are getting the absolute best on the market. ABSS have recently supplied two Abrasive Blasting Systems to Defence Coating Systems at their Wingfield SA facility. Defence Coating Systems are a major supplier to the Defence Industry and the Mining Industry. DCS are one of South Australia's leaders in Protective Coatings. Specialising in Protective Coatings, Chemical Pre-treatment and Powder Coating, they have expanded their capabilities with the purchase of an ABSS Abrasive Blast Room and an ABSS Tumble Blast Turbine Machine.